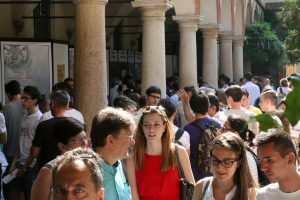 The University of Pavia has been confirmed as one of the major universities according to the Censis-Repubblica 2017/2018 ranking, announced on July 3, 2017. For the ninth consecutive year, our University, with 91.6 points out of 100, is on the podium of the ranking. It concerns universities – according to MIUR data – with 20,000 to 40,000 members. The University of Perugia is first on the ranking. Censis-Repubblica is an articulate analysis of the Italian university system through the evaluation of universities (state and non-state, divided into homogeneous categories by size) with respect to available structures, services provided, internationalization and communication capacity 2.0. The University of Pavia is distinguished by facilities (96 points), internationalization (94 points) and scholarships (92 points), achieving excellent scores for both digital communication and services (90 points) and other services (84).